Tugs & Offshore - LamaLo Technology Inc.
LamaLo Technolgy has conducted shafting alignment and vibration analysis and measurements on over 30 new build ATB Tugs., and continues to more vessels of this Class each year. Work includes theoretical alignment and lateral (whirling) vibration analysis and measurements. All vessels that LLT has worked on during construction have operated without incident. Troubleshooting work is also conducted each year on other vessels. MV Harvey War Horse II was constructed by Eastern Shipbuilding Group. 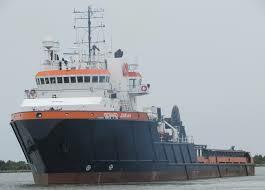 The vessel has an overall length of 145' and has a twin screw propulsion configuration. Each of the 4 bladed fixed pitch propellers is directly driven by a diesel engine, with a rating of 5000 HP at 900 RPM, through a single reduction reversible gearbox. The propulsion shaft is approximately 49' long, and is supported by a strut and sterntube bearing. The main gear shaft is supported by two bearings. LamaLo Technology Inc. (LLT) was contracted by Eastern Shipbuilding Group to assist with the propulsion shaft alignment. LLT conducted a theoretical alignment and a lateral (whirling) vibration analysis, and provided final alignment using the strain gauge technique. The MV Seabulk Luanda, a 65m Anchor Handling Supply (AHS) vessel, and was constructed at Labroy Shipyards in Batam, Indonesia. The vessel has a twin screw propeller configuration. Each of the 4 bladed controllable pitch propellers is directly driven by a MAK 9M25 diesel engine with a rated power of 2,970 kW at 750 RPM, through a single reduction reversible gearbox (4.839:1). The propulsion shaftline is approximately 17.5 m long, and is supported by an aft and forward sterntube bearing, and an intermediate shaft bearing. The main gear shaft is supported by two bearings. LLT conducted a theoretical alignment and a lateral (whirling) vibration analysis, and provided final alignment using the strain gauge technique. 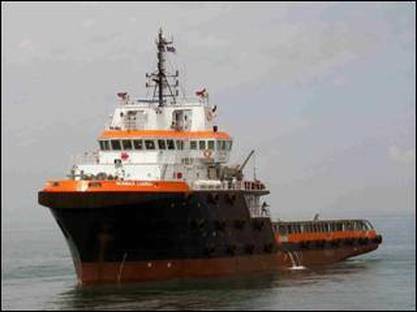 The vessel was delivered in 2005 and has operated without incident. The MV Julia is a 120' twin screw Tug that was delivered in 1998. Each of the 5 bladed fixed pitch propellers is directly driven by a diesel engine, with a rating of 3505 HP at 900 RPM, through a single reduction reversible gearbox. The propulsion shaft is approximately 35' long, and is supported by a strut and a sterntube bearing. The main gear shaft is supported by two bearings. High shaft vibrations were reported on this class of vessel shortly after delivery and damage/failure of the propeller shafting occurred. The propeller shafts were then replaced with higher strength shafts, and the vessel ran without incidence until 2006 when a broken pinion tooth on the starboard gearbox was detected and scuffing of pinion teeth was observed on the port pinion teeth. Both port and starboard pinions were replaced and the starboard bull gear was replaced. LamaLo Technology Inc. was contracted to investigate the source of the pinion failure, conduct a theoretical finite element analysis of the alignment and whirling characteristics of the shaftline and assess the design arrangement. Strain gauge alignment measurements and analysis were also conducted. Recommendations for realignment were provided. 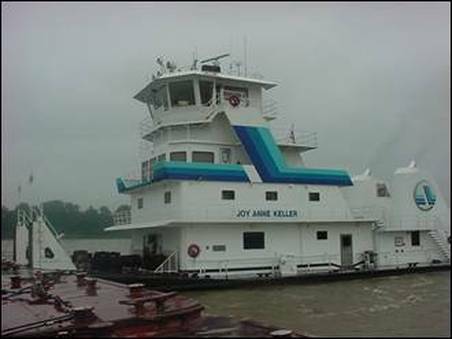 The MV Joy Anne Keller (Keller), a 180' T.S. Tow Boat that operates on the Mississippi River. The Keller was built in 1999 and has a gross tonnage of 1061. The vessel has a twin screw propeller configuration. Each of the 5 bladed fixed pitch propellers is directly driven by a diesel engine with a rated power 4000 HP at 900 RPM, through a single reduction reversible gearbox. The propulsion shaftline is approximately 43' long, and is supported by a strut and stern bearing (outboard), and a lineshaft shaft bearing. The main gear shaft is supported by two bearings. LamaLo Technology Inc. was contracted to investigate the source of a main gear pinion failure. A theoretical finite element analysis was conducted of the shaftline and the design arrangement was reviewed. Strain gauge alignment measurements and analysis were also conducted. 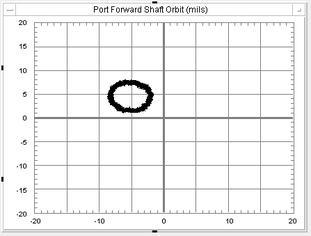 The propulsion shafting was found to be severely misaligned to the gearbox, such that the aft gearshaft bearing load was over-loaded and the forward bearing was top-loaded. This misalignment was considered to be the source of the pinion failure. Recommendations for realignment were provided and implemented. The MV Seabulk Vung Tau, a 63m Anchor Handling Supply (AHS) vessel, is under construction at Labroy Shipyards in Batam, Indonesia. The vessel is a first of four “E” class vessels. It has a twin screw propeller configuration. Each of the 4 bladed controllable pitch nozzled propellers is directly driven by a diesel engine with a rated power of 2,540 kW at 750 RPM, through a single reduction gearbox. To reduce the risk of propulsion shafting problems LamaLo Technology Inc. (LLT) was contracted by Seabulk International Inc. to provide an independent theoretical shafting alignment analysis, to review the design arrangement, and to provide strain gauge alignment analysis. 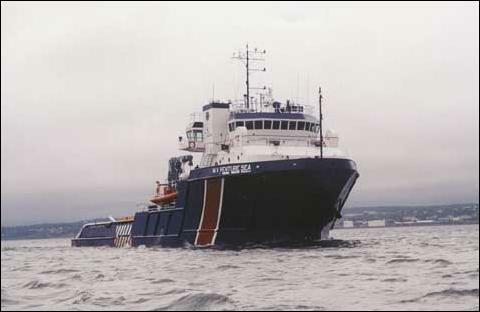 The MV Venture Sea was delivered in 1998/1999 and operates out of Dartmouth, Nova Scotia. Excessive vibrations were experienced since delivery of the vessel, and the port propeller shaft broke off at the propeller flange in the fall of 1999. The vibrations were attributed to excessive shaft whirling as a result of a misalignment of the propulsion shaftline such that the stern tube bearing was unloaded. The shaftlines were re-aligned in January 2000. However significant structural vibrations were still present. Cracks in the structure around the nozzle and on the deck coverings also occurred. LamaLo Technology Inc. (LLT) was contracted to measure and assess the installed propulsion shaftline vibration characteristics, to determine if the vibrations are potentially harmful to the machinery components, and if so, what would be the recommended course of action. 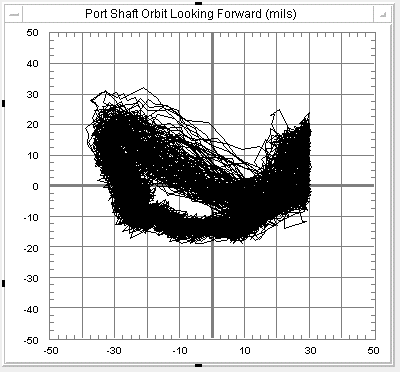 It was found that excessive lateral (whirling) shaft vibrations are present above engine speeds of 700 RPM during all operations (see plots below). Subsequent to the vibration measurements, as recommended by LLT, the maximum engine speed was limited to 700 RPM. The ship vibrations are reported to be no longer present under this operating condition, and the vessel still meets its operational requirements with significant fuel savings. Static alignment using the strain gauge technique. Shaft torsional vibration using strain gauges. Shaft whirling vibrations using non-contact displacement transducers. Machinery and structural linear vibrations using a hand held vibration meter. A qualitative assessment of structural vibrations. It was concluded that the source of the noise was from the propeller, and was due to resonant vibration of the propeller blades induced by vortex-shedding from the trailing edge of the propeller (commonly called “propeller singing”). The trailing edge of the propellers was modified appropriately. It was found that the “loud noise” was no longer present in subsequent operations. Below are plots of the shaft torsional vibration measurements with and without the propeller “singing”. Propulsion System Failure Investigation. Determined cause of failure of machinery components and least-cost solution. This included measurement of the propulsion shaft axial, lateral and torsional vibration characteristics and the alignment condition. Repair and re-alignment work was done on the Seacor Vantage in the winter of 1999/2000. The Seacor Vision re-alignment was conducted in the fall of 2000. After this work, measurements on the vessels indicated acceptable alignment and vibrations. 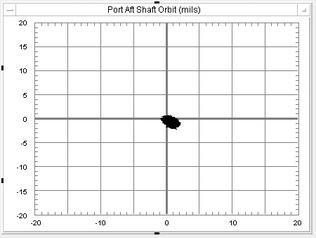 The vessels have been operating since with not further propulsion shafting failures. Propulsion system alignment and vibration measurements and analysis. Shaft alignment measurements indicated an uneven bearing load distribution. 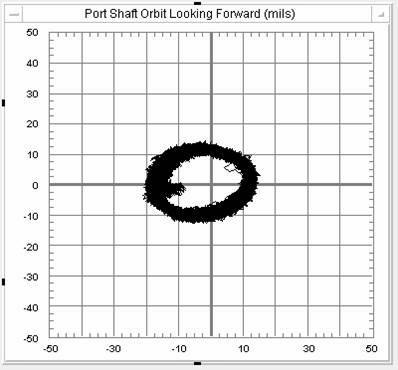 Concern was expressed about the possibility of excessive lateral vibrations (whirling) of the main gear shaft and the long-term consequences. To determine if these vibrations were excessive, the dynamic vertical and horizontal shaft displacements were measured at the forward and aft end of the gear shaft, and at the forward end of the propeller shaft. Dynamic shaft alignment measurements were also obtained using the strain gauge technique. The measurement results indicated acceptable shaft lateral vibrations throughout the operating profile of the vessel. Example plots are shown beside.